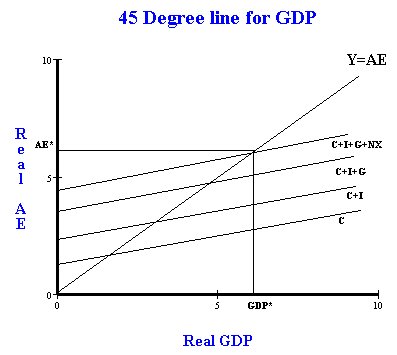 Aggregate expenditure and the 45 degree line (Keynesian Cross) - FreeEconHelp.com, Learning Economics... Solved! The BIG difference between the two is in how I (investment) is interpreted. When measuring real GDP, investment measures actual investment taking place in the economy, while in the aggregate expenditure equation, investment measures “planned investment” which is subject to change based on actual economic conditions. What we do next is construct a graph with real GDP on the X axis, and real aggregate expenditure (AE) on the Y axis. 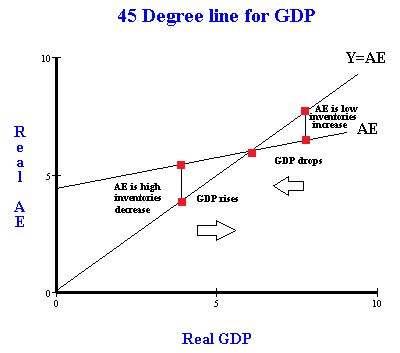 We then construct a 45 degree line which shows us at every value where AE is equal to Y, or the economy is in equilibrium between aggregate expenditure and GDP (also planned and actual investment). This line is labeled Y=AE. We then construct the aggregate expenditure line by adding up the values for consumption (C), planned investment (I), government spending (G), and net exports (NX). Note that I+G+NX always has the same value regardless of GDP, but consumption has a positive intercept with a positive slope. This is because real GDP equals income received, and consumers will spend a portion of this income on goods and save some. So as real GDP rises, C will also increase, but the other components (I+G+NX) remain constant. Where these two lines cross indicates equilibrium in the macroeconomy. At this point AE=GDP and planned investment equals actual investment. Without shocks or changes in the economy, this is where we will end up and have a good estimate of what real GDP is. Finally, if we are not in equilibrium, then either aggregate expenditure are too high, or too low. If aggregate expenditures are too high, then businesses have to sell off their inventory. This results in higher investment as businesses produce more to catch up. This means the real GDP increases. Likewise, if aggregate expenditures are too low, then businesses build up their inventory. This results in lower investment as businesses slow down production because warehouses are filling up. This means that real GDP will decrease. Note that we will always end up at the equilibrium point, but this 45 degree line can show us how we get there given current levels of AE and planned vs actual investment. This reference generator provides an overview of eight tools that can free your mind and massively boost your productivity. Hi. I'm confused whether we should take real or nominal GDP on the x axis. Also, which GDP should we use in the formula for the multiplier?